"How to Use Foam Ear Plugs"
Ear plugs for sleeping, especially when sleeping in a noisy bedroom, is a category we take seriously. 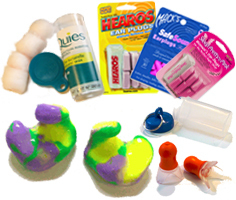 Here you will find a wide variety of different earplugs from disposable foam earplugs that cost less than a quarter, to full custom molded earplugs that cost over a hundred dollars. If you have never tried the many different kinds of ear plugs available for sleep, or if you're specifically looking for a solution to help you cope with snoring, we suggest you start with our Snoring Relief Kit, which contains several different kinds of ear plugs for sleeping/snore-blocking so you can find just the right plugs for you. How Effective are Ear Plugs for Sleeping and Snoring Relief? We know what you want: "artificial deafness." However, the best you can get with ear plugs is a reduction in sound level of about 33dB, since even with your ear canals completely blocked, the bones in your head will conduct sound to your inner ear. Still, even very loud snoring rarely exceeds 85 db, which can be reduced to around 62 db. That means you would still hear sound at about the volume of a normal voice during the most intense snoring, but softer snoring would be reduced a very quiet whisper. In many cases, that much reduction will be enough to allow you to sleep soundly. If so, all you need is an ear plug that is effective and comfortable for you. TIP: In addition to the products listed below you might also consider Industrial Foam and/or Industrial Reusable ear plugs for sleeping. These are made for demanding noise protection and for extended wear on the job, so they can also work great for wearing during sleep, and because they are made for industrial firms, they offer great value for the savvy consumer, like you! Foam ear plugs are a tried and true solution for sleep. All of these foam ear plugs are super soft and designed especially for sleeping. Though most foam ear plugs would help you block out snoring and night-time noises, these are our favorite foam ear plugs for sleeping. When ear plugs for sleeping become a permanent part of your nightly bedtime ritual, it is time to try reusable ear plugs for sleeping. One pair of reusable ear plugs for sleeping can last for weeks with proper care. Because comfort is paramount when it comes to sleeping with ear plugs, we have collected here only those reusable ear plugs which really are comfortable enough to wear during sleep. When it comes to ear plugs for sleeping, professional lab custom molded sleeping ear plugs are the best of the best. Comfort and a high NRR are critical when finding a good ear plug for blocking out noise and getting a good night's sleep. Professional lab custom molded ear plugs are specially made to fit your unique ears perfectly, making these custom plugs by far the most comfortable ear plugs for sleeping available.